Hey there! Time got away from me, but it’s finally time to take a look at the first appearance of the Hand, in Daredevil #174 (published in 1981), written and penciled by the one and only Frank Miller. Let’s dive right in. Elektra learns that the Hand are planning a hit on her former lover, Matt Murdock, and despite her insistence that she hates him, she gets on the first plane back to New York to protect him. 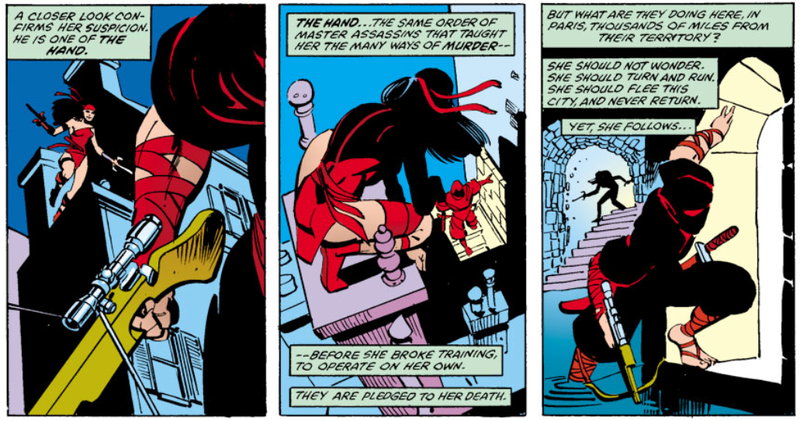 Elektra arrives in New York just in time to help Matt tackle the Hand when they attempt a quick kill in his apartment. As far as they know, Matt is just your average blind lawyer. The ninjas end up meeting greater resistance than they could have ever imagined. After a prolonged fight scene, we learn something else about the uninvited visitors: They dissolve when defeated. Matt hasn’t killed anyone, but being beaten by a blind guy with only a stick for a weapon seems to be embarrassment enough to make these guys want to commit some mystical form of harakiri. I always wondered about how the Hand seem to go through ninjas as if they had an endless supply. I still have problems understanding the appeal of being a Hand ninja, but I guess the job must come with great perks. In the next room, Matt finds another dissolved ninja and realizes that someone must have come to his aid. But who? Why, Elektra of course! Matt doesn’t know Elektra is back in town however, and goes back to his usual routine. The next day, at the office, Matt is the target of a hit when the Hand hope to seal the deal. A bomb goes off, and Matt is hurt. When he wakes up in the hospital, he realizes that his radar sense is gone (as seen in A history of the radar sense #5). 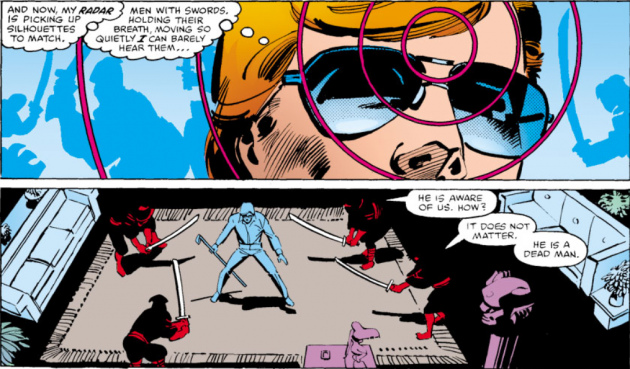 As unwise as it seems to go out as Daredevil while being as compromised as he is in this situation, Matt decides to suit up and go fight some ninjas. I never really understood Miller’s decision to pursue this particular storyline since it makes the radar sense seem somewhat superfluous, but now I’m going off-topic. 😉 Either way, both Elektra and the Gladiator (whom Matt is defending in court) come to his aid, though Matt seems only vaguely aware of this. Instead, he’s mighty proud of being able to hold his own while fighting blind, not knowing that Elektra does much of the heavy lifting. The ninjas meet a cruel fate when they face their jonin, who pits them against a very large and powerful adversary. He is not identified as such in this issue, but we know that he is Kirigi! More on him, and other things Hand-related in a later post!